St Andrews United started their league campaign with a narrow defeat at Tranent. 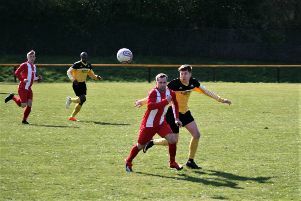 St Andrews United manager Craig Morrison is convinced he’s seeing certain signs of progress within his side at Barnetts Park. St Andrews are only a couple of games into their new camapign, losing to Tranent on Saturday before beating Thornton Hibs in midweek. The Tranent defeat came with Saints missing seven key players. A few returned for Wednesday’s win at home to the Hibs, and Morrison is sure his side will now go on to build on that. He said: “What I would say about the Thornton game is that I’ve no doubt it’s one we wouldn’t have taken anything from last season. “But we’re progressing which is pleassing for me as manager. This weekend Saints host Haddington. The visitors to Barnetts Park have started their season well, winning twice and scoring ten goals across the two games. “We know we’ll need to be structured and disciplined” said Morrison. “Stats don’t lie, they’re obviously free-flowing going forward and have quality in the final third. “But we’ll go into the game and set our own stall out.